After LeBron James’ disappointing performance in the NBA Finals, everyone from Charles Barkley to my grandmother said James needed to develop a post game. That wasn’t quite true, however. Did James need to post up more often? Yes. Did he need a back-to-the-basket game that would remind us of Hakeem Olajuwon, Zach Randolph, and late-’90s Michael Jordan? No. Even last season, before James “developed” any moves on the block, he was one of the most efficient post players in the league. He shot 53.2 percent in the post and his 1.043 points per possession there put him in the 91st percentile among all NBA players. His numbers were so good that I named him one of the five best post players in the game after the season. This year, James’ post game is a talking point. We can’t watch a Miami Heat game without hearing how much James improved over the offseason. James even tipped his hat to his low-post evolution in an interview during Sunday’s game against the Chicago Bulls. The problem is that James’ low-post numbers are actually worse than they were last season. His 0.958 points per possession put him in the 77th percentile among all NBA players. The key, however, is that James is posting up more often than he did last year. He sets up in the block on 13.4 percent of his possessions this season versus 7.9 percent last season. James’ true weakness was not posting up enough, and he should be praised for playing there more, even if his numbers have dipped. Why? Because even when his numbers have declined, James is still a very effective post player, and when he gets more possessions on the block that means he’s spending less of his time launching step-back 3s. Let’s look at what James did last year in the post and what he does this year to see what’s most effective. James went from facing up 35 percent of the time last year to 25.9 percent of time this season. It’s as if James heard the criticism about his post game and decided to back his man down more often to prove people wrong. 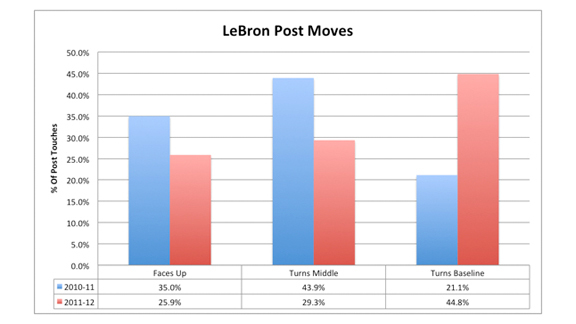 But James is more turnover-prone with his back to the basket than when facing up. When James plays with his back to the basket, his defenders are allowed to be more physical. They can put a forearm in his back or nudge him off the block with a knee. This gives James less room to operate, and that can lead to turnovers. Also, physical defense tends to elicit equally rough reactions from the post-up player. The more often James has to fight for position, the more often he’ll be called for offensive fouls. In fact, with his size and strength (and the fact that defenders know they probably have a better chance flopping than trying to stop him), James probably gets called more offensive fouls while fighting for position than he deserves. Also, when players focus on backing down their defenders with force, they tend to get loose with the basketball. That might also explain some of James’ turnovers. James is most dangerous when he catches the ball in the post and faces up. Some purists might say this isn’t a true post game, but the fact remains that defenders want to avoid James facing them up at all costs. He’s so effective in these situations that it’s a wonder he doesn’t turn and face in the post eight times a game. James scores 1.143 points per possession when he faces up on the right block and one point per possession on the left side. When he backs his man down, James scores 0.938 points per possession. James is so effective facing up because defenders can’t put their hands on him and he can attack them in so many ways. When he turns and faces the defense, by rule they have to take their hands off him. From there, James can survey the situation without pressure. If the defense backs off him, he can shoot a short jumper. When a defender guards him close to take the jumper away, James can blow by him and get to the rim. Facing the basket gives James a chance to size up his man, and no matter how a defender guards him, James will be able to create a good scoring opportunity for himself. This is not to say that James is a poor back-to-the-basket player. He does, after all, shoot 52 percent in the post and score more efficiently there than 76 percent of NBA players. James’ low-post game is similar to Dwight Howard’s — no fancy footwork, not too many pump fakes, just one power move with one basic counter. James’ favorite back-to-the-basket move is a simple spin where he turns toward the baseline and bumps the defense off balance with his body to create space for a shot. When James backs his man down, the defender pushes back to prevent James from getting closer to the basket. When James feels that force on his back, he spins baseline. Usually, the defender is working so hard to push James out that he can’t stick with James on the spin. The defender loses his balance for a split second, and that’s all James needs to rise for a short jumper or explode to the rim. James’ countermove is a simple but effective spin to the middle after a head-and-shoulders fake to the baseline. Look at what Evan Turner has to deal with here. James is backing him down, and Turner knows that James likes to spin baseline (in fact, James spun baseline on Turner a couple times earlier in this game). Because of this, Turner overplays him on the baseline side to prevent James from spinning. When James picks up his dribble, he gives a little shoulder shimmy toward the baseline and freezes Turner. James has the middle all to himself and Turner can’t even contest James’ easy 2 in the paint. James’ passing ability adds another dimension to his post game and the Miami Heat offense. He’s looking for his teammates, whether they get open off a double team or a help defender gets caught ball watching. James can also pass after he starts his move to the basket. It’s easy to read when some NBA post-up players will shoot or pass out of a post move. Others just won’t pass after they get to a certain point in their move, and that’s when they become vulnerable to double teams. With James, that never happens. Even when he goes up for a shot, if a defender leaves his man to crash the boards, James will make the pass more often than not. The notion that James has improved his low-post game is a myth. James is a good post player this season, just as he was last year. He’s been playing with his back to the basket more often than last year, perhaps because he wants to prove his doubters wrong, and that has made him a less efficient post player than he was last season. What’s most important, however, is that James is posting up almost twice as often as he did last year. Even though James has been less efficient in the post, the fact that he is posting up more has turned him into a more efficient player overall. Last year, James’ overall points per possession was 1.028, and that placed him in the 86th percentile of all NBA players. This season, James’ PPP of 1.056 puts him in the top 9 percent. Even if he’s less efficient in the post this year, James on the block is still more efficient than James spotting up for jumpers, something he did on 9 percent of his possessions last year. This season, James is spotting up just 4.3 percent of the time, and many of those extra possessions are going to him in the post. This means more shots at the rim, better numbers for James, and a very confident and dangerous Miami Heat team.